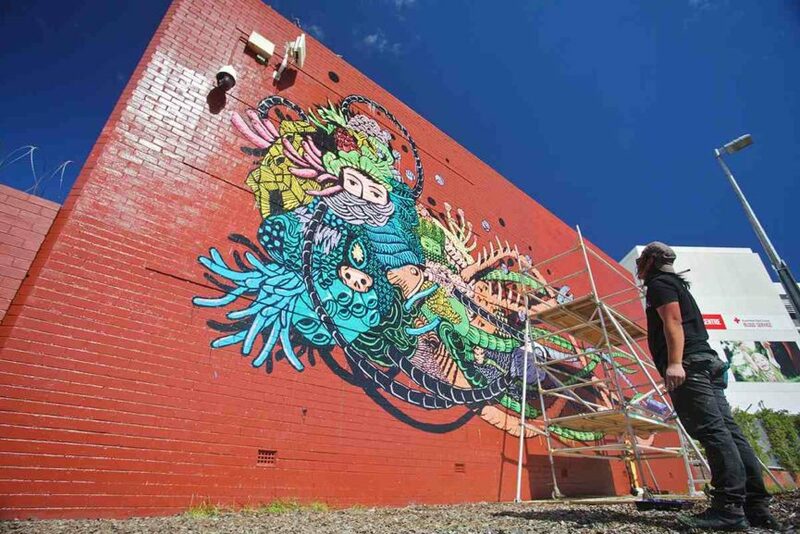 Public is one of the largest street art festivals in Australia and the 2015 Public festival saw 50 international and local street artists travel to Perth to help transform the area. 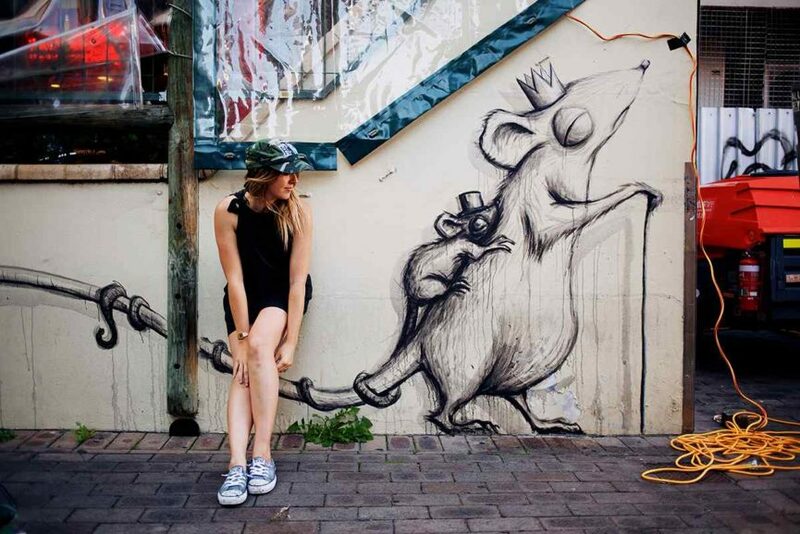 The Public street art festival is a celebration of art and ideas, exploring the notion that street art can work as a catalyst for transforming and shaping our environments. 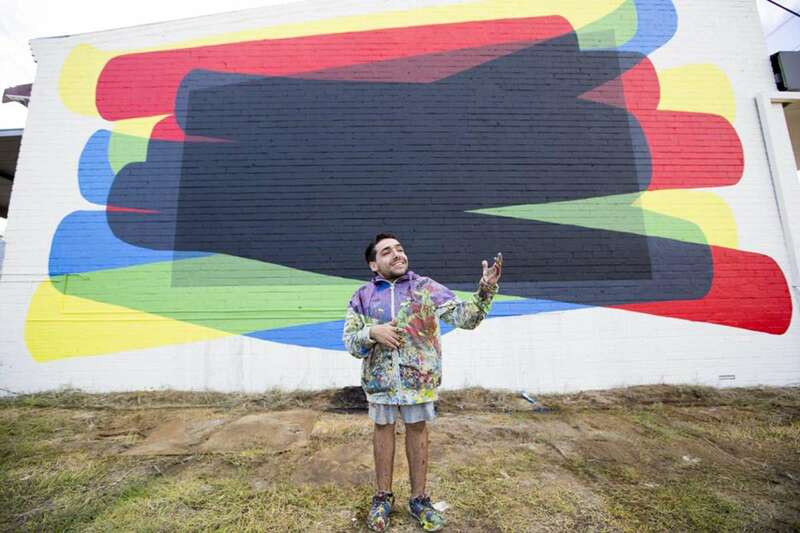 Public is a three year program exploring art in the community, inviting some of the biggest names in street art to create murals in Perth and surrounding areas such as Pilbara and Wheatbelt. 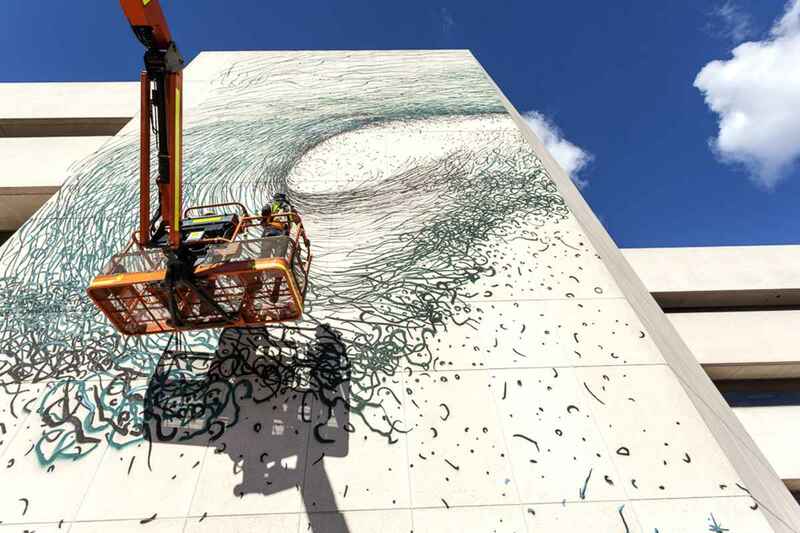 Public 2015 boasted a stellar line-up of street artists including DALeast, Phlegm, Curiot, Waone, Eko Nugroho and Fintan Magee amongst many others, who added much colour to the streets of Perth with their street art. 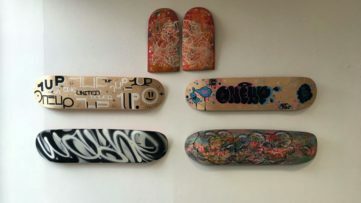 Public 2015 took place in mid-April and of course, the street artists produced some spectacular results, to find out more about the festival take a read of Public 2015 and Public Festival. 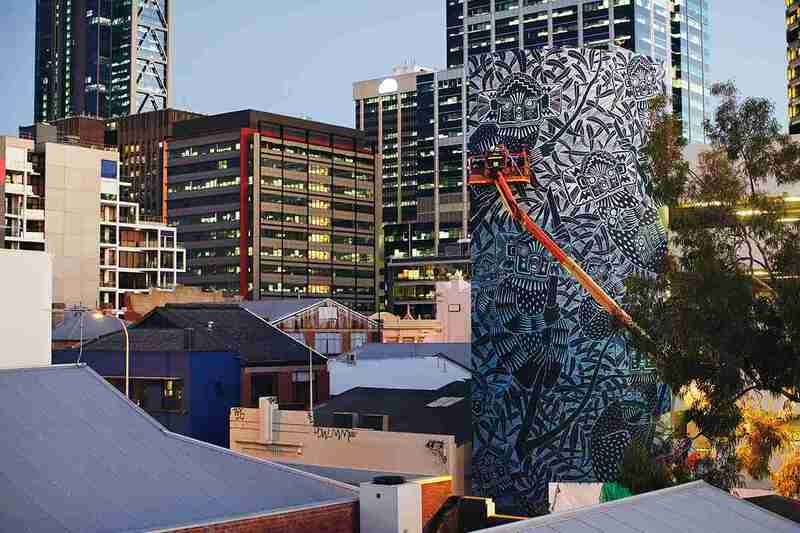 Now the dust has settled, Widewalls takes a look through 10 of the murals created at Public street art festival in Perth, Australia, 2015. 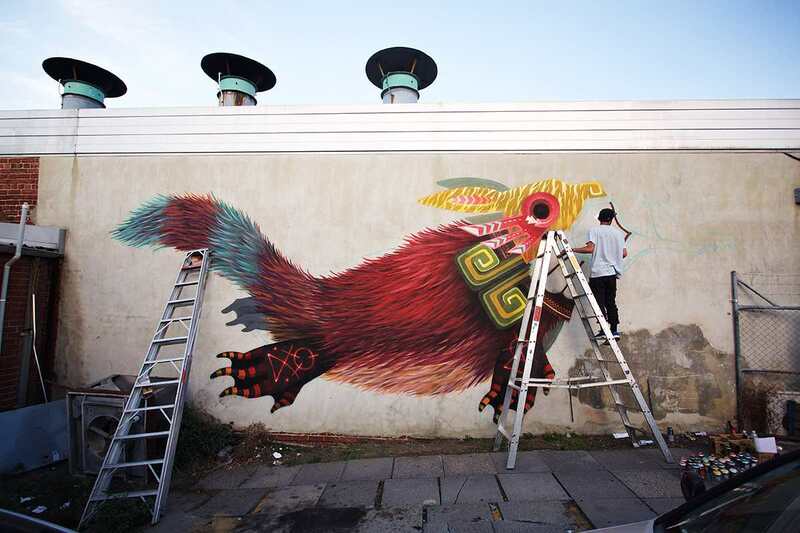 Mexican street artists Curiot headed to Public 2015 with his beautiful street art, often comprised of mythical creatures blended with animal and human forms. The work of Curiot is too amazing to not include images from two murals he created in Australia, one a huge black and white mural, consisting of some wonderful creatures hanging out in a tree, complete with Aztec style faces creating an imposing scene. The second, created in Nick’s Lane, Chinatown, features a signature style Curiot mythical creature, rich in texture and colour, transporting us into another world. Curiot – Creature Mural, Nick’s Lane Chinatown. Public Festival. Photograph by Jarrad Seng, courtesy of FORM. 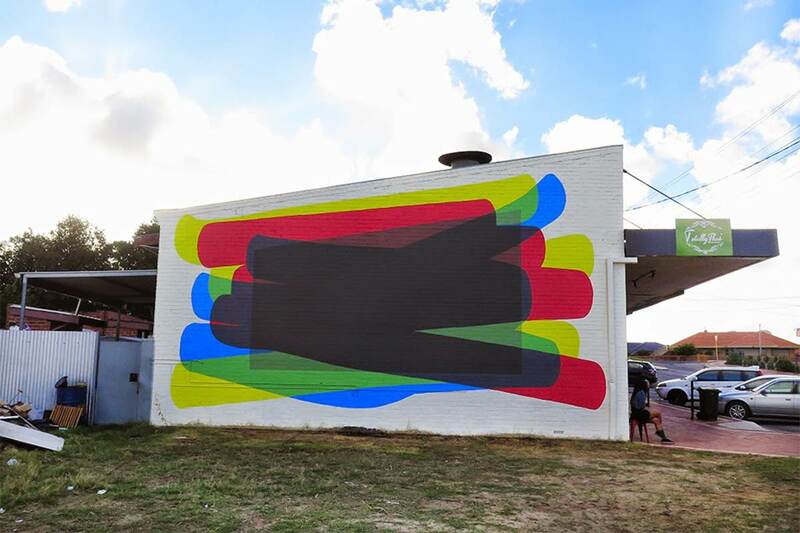 Curiot – Mural Perth (2015). Public Festival. Photograph by Jarrad Seng, courtesy of FORM. One thing you can say about Chinese street artist DALeast is that he never disappoints with his amazing street art. 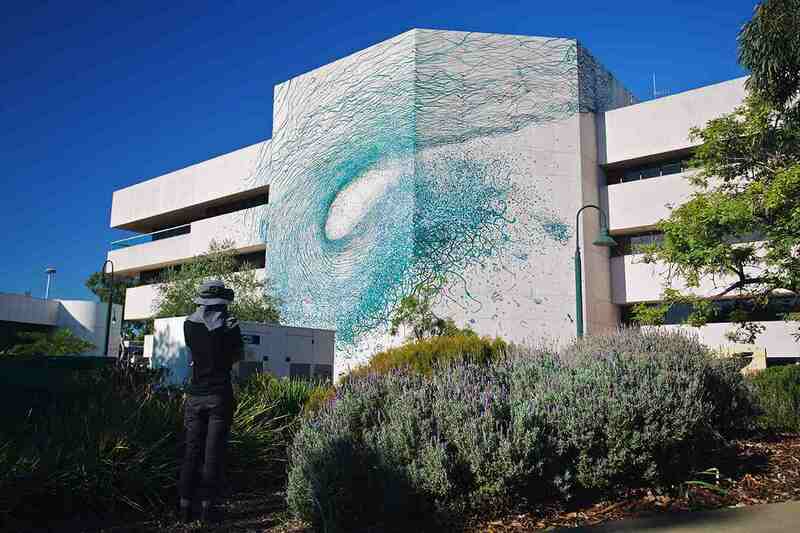 Public 2015 saw DALeast create this fantastic mural over the course of a week, a stunning blue wave breaking over the Watercorp building in Leederville. The mural is constructed from the magnificent line work of DALeast that is present in all of his unique pieces of street art, the lines of the waves swirling around the building as if they are alive with tentacles. Images:Mural in progress photo by Bewley Shaylor. Finished mural photo by Jarrad Seng, both courtesy of FORM. 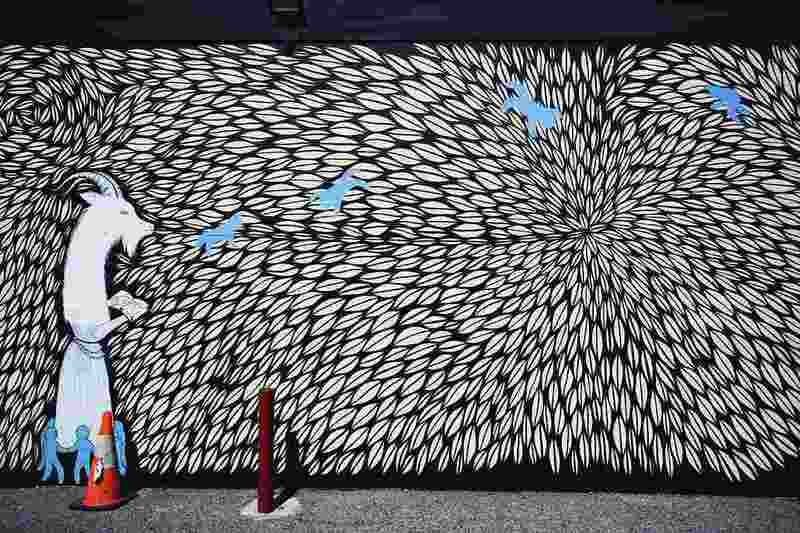 Acclaimed Indonesian street artist Eko Nugroho was also as Public 2015, where he created this wonderful piece of street art at Western Power in East Perth. Eko Nugroho is recognised for his unique visuals, often combining human body parts with machinery in fantasy style works and influenced by Indonesian society. This wonderful mural is comprised of many elements as one would expect from the artist, surrounded with what look like tentacles and sea, while skeletal tails drift away to the right. Another stunning creation which makes us drift off into another realm. Finished mural photo by Jarrad Seng, deatil photos by Bewley Shaylor, courtesy of FORM. Argentinian artist Elian created this simple but effective piece of abstract art for the Public 2015 street art festival in Perth, Australia. The mural, created in Victoria Park, comes with the title Repeating Shapes and Elian describes the street art piece as belonging to a series of paintings inspired by the shapes of walls. 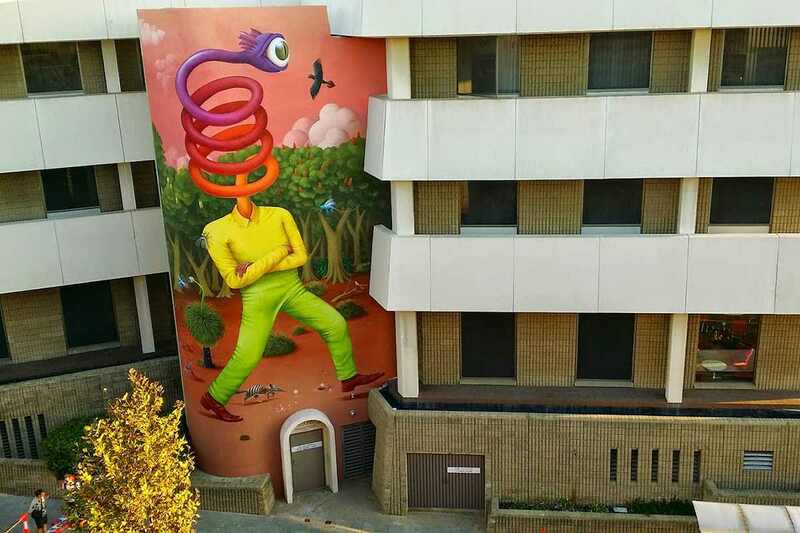 Repeating Shapes is the latest in a long line of stunning murals created by Elian, many incorporating bold colours and shapes that emphasise the buildings they are created on. 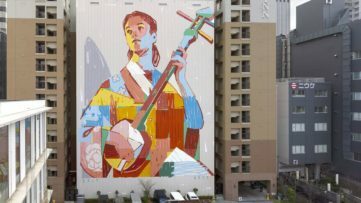 Photo of mural via street art news. Photo with Elian by Jean-Paul Horre, courtesy of FORM. Australian artist Fintan Magee has become well known for his wonderful painterly technique and exploring themes around consumption, waste and the urban environment. 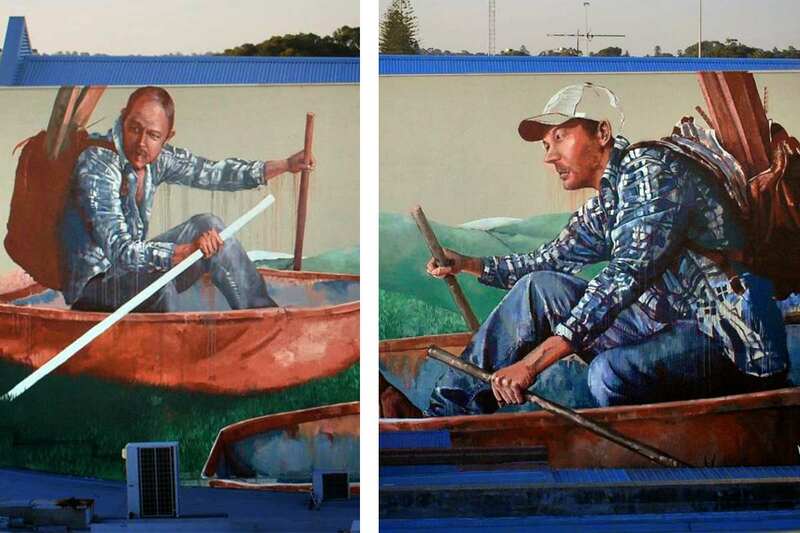 At Public 2015 street art festival, Fintan Magee took the opportunity to create this huge mural entitled Road to Nowhere and depicts two men in their rowing boats. 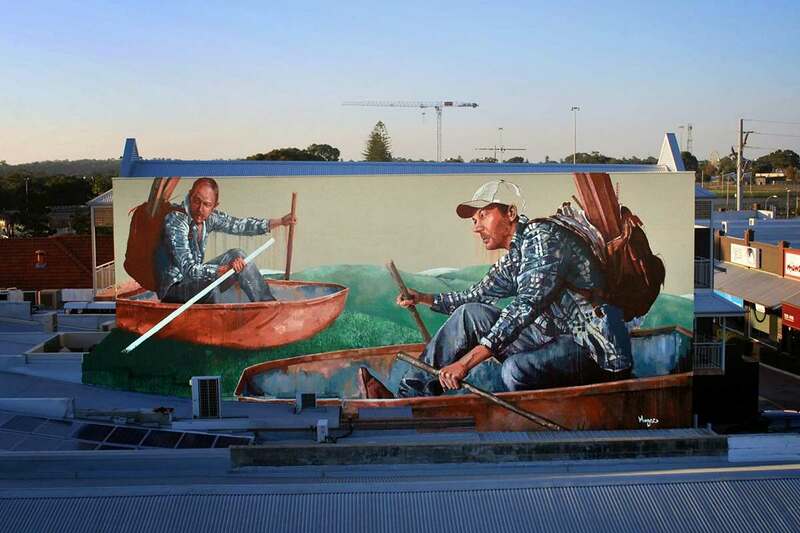 The mural makes reference to the recent displacement of many people due to flooding in Brisbane, continuing the themes to be found in his work and created in his excellent painterly style. Sometimes it’s easy to have our attentions swayed by the stunning and huge murals that are often created at street art festivals, therefore missing the smaller treasures that lurk around the corner. Here we find one such wonderful piece of street art by British born, but now Perth based, artist Hayley Welsh. This delightful piece of street art was created in Old Shanghai in Chinatown, painted in the unique style that Hayley Welsh has developed over the years, often featuring fairy-tale like images that appear whimsical and light hearted, but often containing darker themes beneath the surface. Photograph by Jarrad Seng, courtesy of FORM. 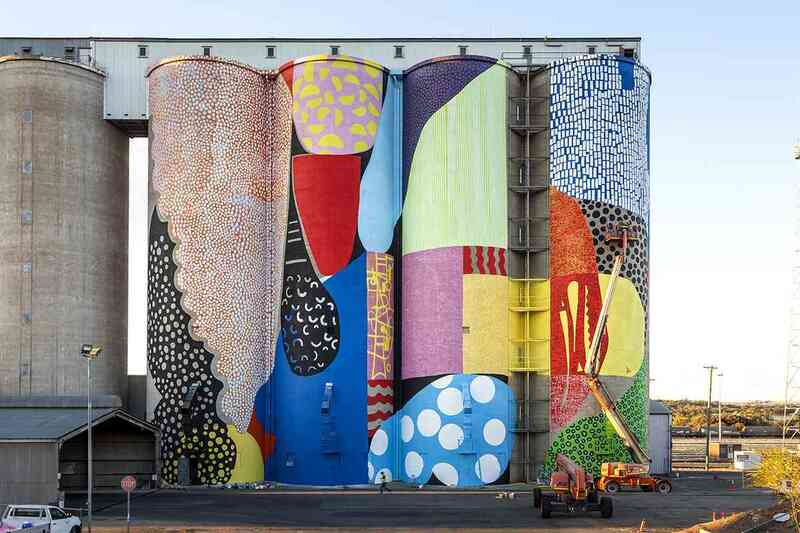 Street artist Hense travelled to the Wheatbelt to create his stunning contribution to Public 2015 street art festival. 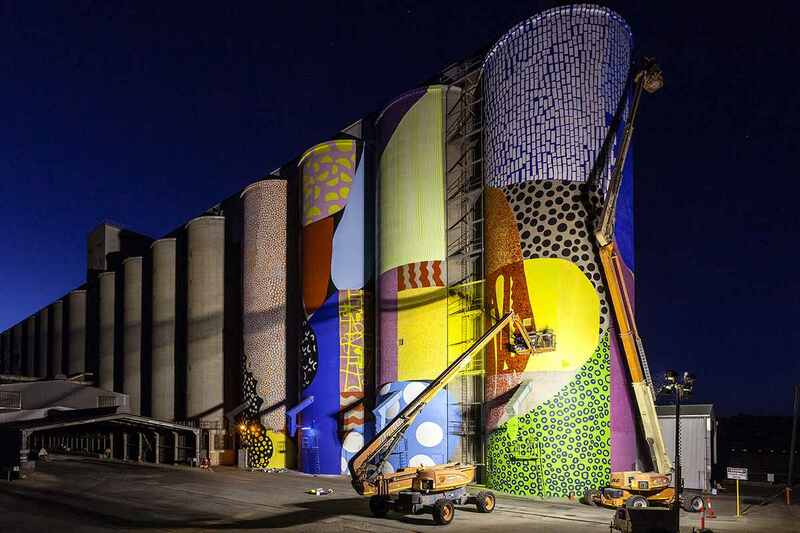 Hense tackled these four massive silos for Public, creating his second largest mural to date with his signature style. 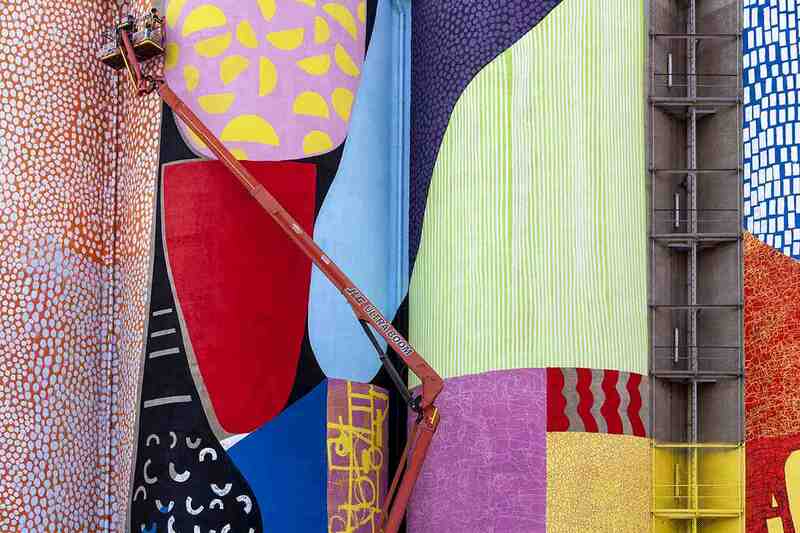 Hense, otherwise known as Alex Brewer, has become recognised for his colourful and abstract way of working and treated the huge structure as if it was a canvas on a wall in a studio. 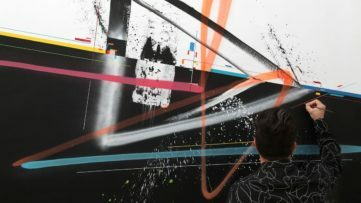 The talented artist takes mark making onto a massive scale, creating marks that are several metres long, but with ease making them look like natural brush strokes on a much smaller scale painting. Hense was included in our Ten instagrams of April article. 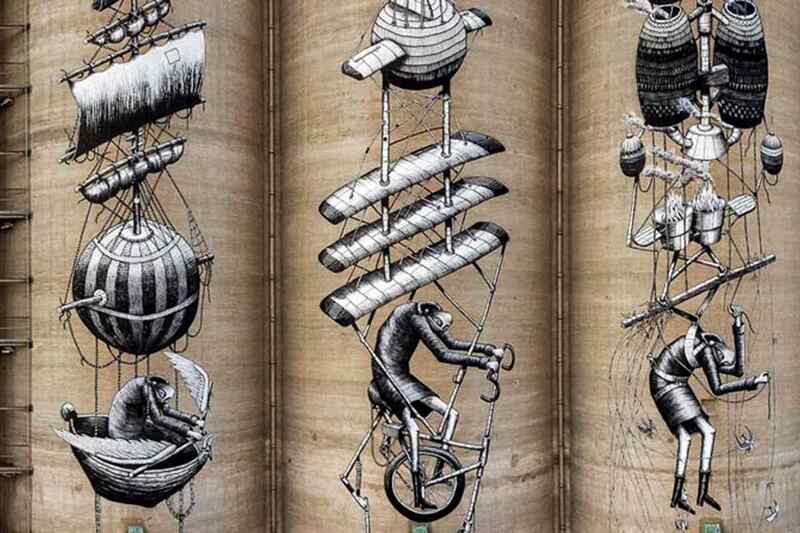 British street artist Phlegm is another artist who never fails to impress with his inspired street art and murals. 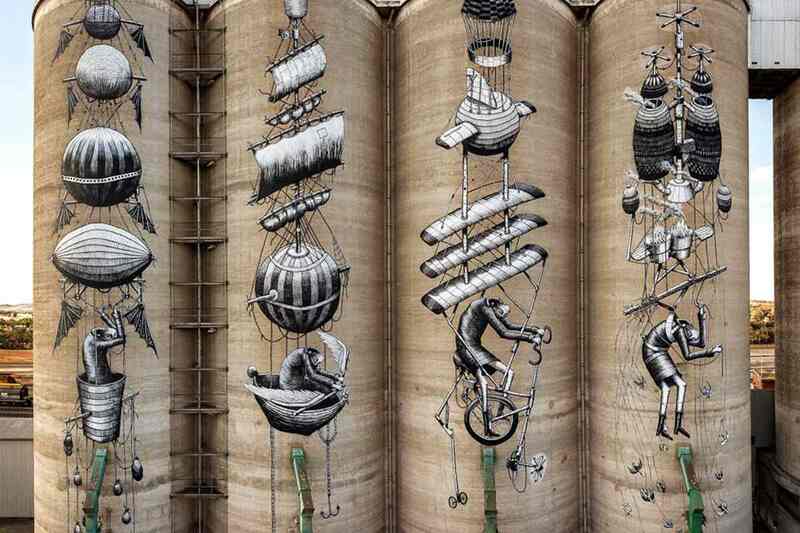 Phlegm also took on some of the huge silos for his contribution to Public 2015, producing a series of his wonderful characters floating across the structure in various flying contraptions. Looking like something a mad scientist would come up with, the black and white images are a fantastic addition the concrete surroundings. Not satisfied with that, Phlegm also created a monstrous octopus grabbing hold of a man, this time on a wall in Freemantle. Images via street art news. Robert Jenkins is a self-taught artist, illustrator and muralist originally born in Wales, but now working out of Perth in Australia. Inspired by record covers, skateboards and horror movies, Robert Jenkins enjoys creating images which combine elements of dark nightmares with graceful women and strange furry creatures. 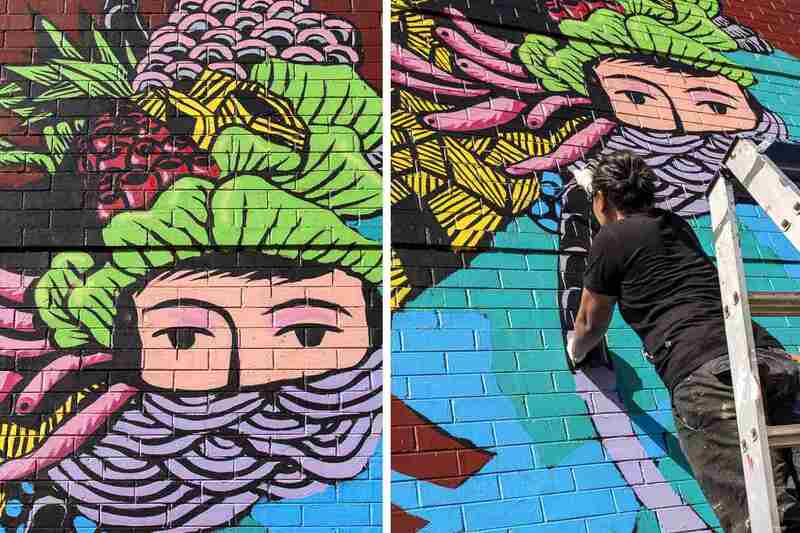 His mural for Public 2015 street art festival was created on the side of Ria Malay restaurant in Leederville and resembles some strange dark and ancient ritual, with a group of small figures surrounding a goat like figure. 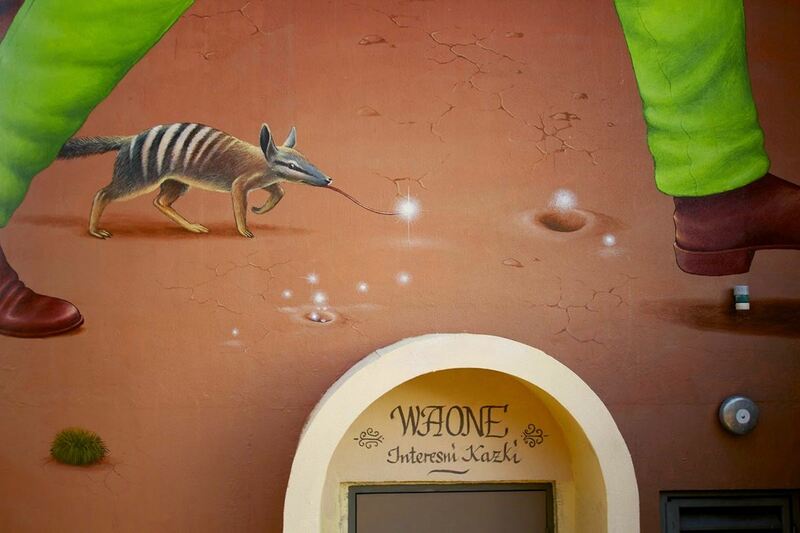 A beautifully illustrated mural and a delicious treat for those visiting the restaurant! Finally, in our look through ten murals from the fantastic Public 2015 street art festival in Perth, Australia, we have this amazing beauty from Waone. Forming one half of the Ukrainian art duo Interesni Kazki, Waone headed to Australia to paint this stunning Rainbow Serpent mural in Perth. The Rainbow Serpent is an aboriginal mythological creature that often appears in artworks, with Waone transforming it into one of his amazing characters. The mural is definitely one for closer inspection, with many fine details revealing fascinating elements of the work, such as an eye emerging from a plant. A suitably stunning way to end our brief look at some of the amazing street art and murals to emerge from Public 2015 street art festival. 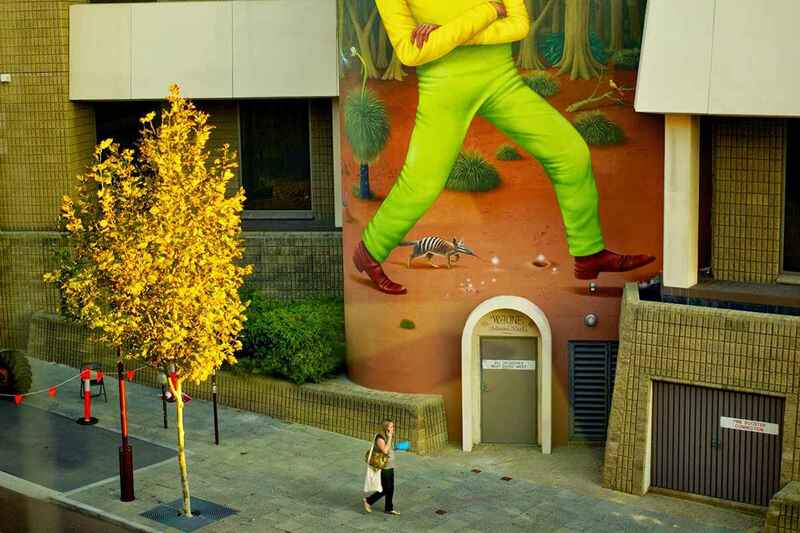 For all the latest news on street art and murals, sign up to My Widewalls today.